Baby Bedding featuring baby crib bedding for your babys nursery bedding. 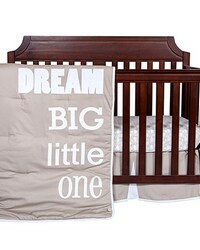 Your baby will love these nursery bedding sets with the wide variety of decorating themes and colors for your nursery. Lucious baby blankets and throws along with bibs and burp cloths are only the beginning of this unique baby bedding offering. Decorating your new cutie's nursery is easy with pink baby bedding for girls and blue bedding for baby boys. 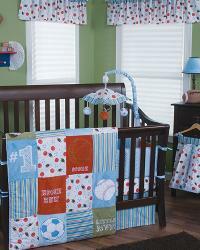 We offer the entire Dr. Zeuss baby bedding nursery crib line along with other unique bedding themes such as western, paisley, floral, retro and modern, traditional as well as college football baby crib bedding. With the many other unique bedding themes offere your baby will sleep in cozy comfort. 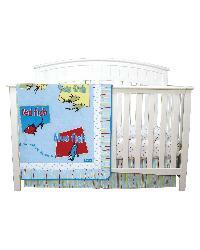 Baby bedding sets are usually available with comforter or blanket, crib sheet, crib skirt and crib bumper pads. Additonal baby bedding set accessories include diaper stackers, window curtains and valances and burp cloths among other popular baby crib bedding offerings and of course all at discount prices. 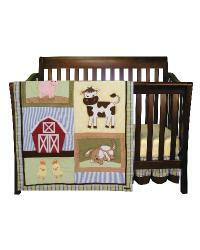 All your little ones favorite barnyard animals bring to life the Baby Barnyard Baby Bedding. Soft yellow, sweet blue and chocolate brown are just a few colors your baby boy will love to look at as he falls asleep. 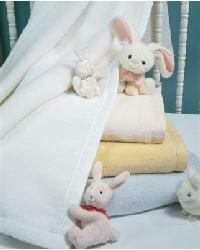 These plush baby blankets are sure to keep your bundle of joy comfy, cozy and secure all night long. This great assortment of baby blankets and throws for your babys and their nursery will be a treasure for many years to come. For a unique baby shower gift, shop our Baby Gifts collection. From baby burp cloths and baby bibs to a unique diaper cake to one-of-a-kind onesies and bottles, these items are sure to be a big hit with the mom-to-be. The Blossoms baby bedding set features a bold modern floral print on a rich chocolate base which gives versatility for your nursery with accent colors of pink, turquoise, sage green and yellow. Beautiful, intricate floral embroideries come to life on solid pink ultra-suede in this delicious pink and chocolate baby bedding set perfect for toddler sized baby's who now roam your nursery. Soft blue baby boy bedding set. Quatrefoil and chevron prints make this a trendy boys room set. Quilted chevron baby bedding for a complete baby's room. 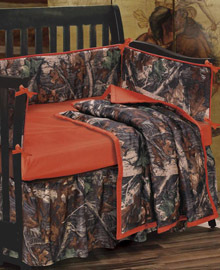 Matching Comforter, Crib Skirt, Sheet Set and Diaper Stacker also available all with the browning deer logo. 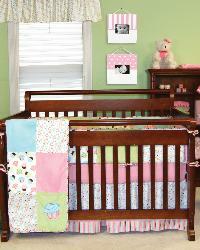 Matching Comforter, Crib Skirt, Sheet Set and Diaper Stacker also available to complete the look of your babys nursery. These realistic camouflage crib bedding sets are just like what daddy wears. Let nature complete the look of your nursery with this camo baby bedding set complete with bed sheets, bed skirts, decorative pillows, window treatments and more made just for your babys nursery. In addition to the traditional camo look this baby bedding collection also features a pink camo bedding for your baby girl. Yeehaw! 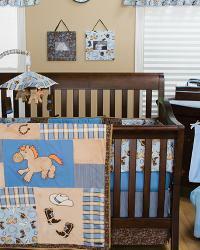 Your little baby cowboy will be ready to ride the open range with the Carson Collection of baby bedding. This crib bedding set is made of deep brown, red and tan in the most popular of cowboy patterns sure to be a delight for your babys western themed nursery. 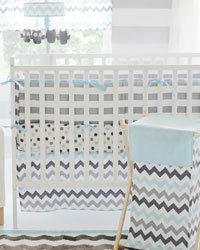 Decorate your nursery with this handsome and modern aqua and gray chevron crib set with matching accessories. Here you will find a clothes hamper, traditional mobile with cute gray owls, chevron rug and more. Soft shades of cocoa and mint green in modern patterns including chevron create a bedding set for the perfect baby nursery. All accessories like hampers, mobiles, bibs, blankets and storage. 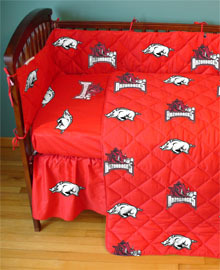 Now you and your baby can show your team spirit with college baby and crib bedding with all the accessories. Your future superstars nursery will be a hit with these collegiate crib bedding sets available from all your babys favorite college teams. Yeehaw! Your little buckaroo will be ready to ride his first bronco or ride the open range when he sees the Cowboy Baby bedding set. The Cowboy Up! crib bedding set in a relaxing shade of blue also offers a mix of great accessories to complete the look of your nursery. This delightful western themed nursery bedding set also offers a chair and ottoman to fit your little buckaroo. A delightful collection of baby sheets that will brighten up the crib in your babys nursery. 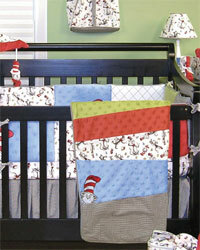 These crib sheets are offered in a wide range of themes from trendy and modern, to traditional. Your babys nursery will look perfect with these crib sheet sets. Deliciously cute! A combination of prints in cupcakes, bubble dots and sweet candy color stripes make this a fun baby bedding that is available with a variey of accessories to complete your babys nursery. This cute crib beddings tonal pink, blue, green and brown colors are accented with cozy soft velour and appliqued cupcakes will make your babys nursery a delight. This is a fun and colorful baby bedding that will keep your baby happy and interested with its mixture of patterns and colors. Dr Seuss says, "My alphabet starts with this letter called yuzz. It's the letter I use to spell yuzz-a-ma-tuzz. You'll be sort of surprised what there is to be found once you go beyond 'Z' and start poking around!" Your nursery or toddlers room will be a land of amazement for your little one when you fill it with this unique Dr Seuss crib bedding. Also available in the Dr Seuss baby bedding is a wide collection of accessories to complete decorating your babys nursery. The Cat in the Hat, how fantastic is that?!!? Officially licenced Dr. Seuss baby and toddler bedding with a wide variety of matching accessories including bed sheets and chairs will make your babysnursery a delight. Your nursery will be a room of wondermous with everyone's favorite cat in the hat and all the available accessories to complete your babys room. "KID, YOU WILL MOVE MOUNTAINS!" Oh the Places You'll Go is a Dr Seuss classic, and now your baby can enjoy all the wonderment in their nursery with this Dr. Seuss baby bedding set. The soothing and restful blue color of this baby bedding is included in a variety of accessories for babys crib and nursery. "KID, YOU WILL MOVE MOUNTAINS!" Oh the Places You'll Go is a Dr Seuss classic that is now available in a pink baby bedding set with a large selection of coordinating pink crib and nursery accessories. 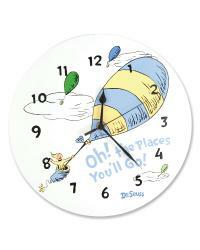 Now your little baby can enjoy all the wonderment of Dr Seuss in their bedding and their dreams. Dr. Seuss's amazingly fun counting and colors book comes to life in your baby's nursery with this primarily blue baby bedding set with coordinated blue crib and nursery accessories. "From there to here, from here to there, funny things are everywhere," and that is what this Dr Seuss baby crib bedding and nursery accessoriess is all about. Aye Aye, Captain. This fun bedding in nautical colors like blue, red and white is perfect for your new little one. Stripes and chevron fabrics. 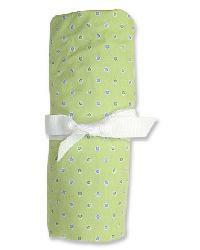 This Aqua and Khaki baby bedding set features a timeless stripe paired with a fun arrow fabric. Mod dots and stripes in sage green, yellow and brown bring a modern twist at an affordable price to your nursery when selecting the fun and happy feeling Gigi baby bedding set. Hello Sunshine features a happy patchwork mixture of chevron, abstract wood grain, pinstripes, and a mini starburst print mixed with charming woven gingham in sunrise yellow and shades of gray mixed with accents of white. Coordinating accessories and nursery decor available. Modern gray and white fabrics in a sophisticated diamond print is combined with stripes and bows. This gender neutral bedding will create the nursery you have been dreaming of. Isabella Baby Bedding is a classic, victorian themed baby crib bedding set with soft pink toile and polka dots and decorative tassels and cords for lovely and unique embellishments. This fabulous nursery bedding set is offered in three variations of accessories. 1-2-3 learn and play with me! 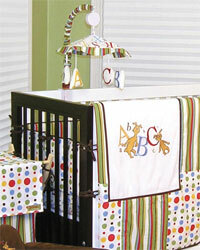 Jungle 123 combines cute jungle animals with ABCs and 123s for a fun and educational baby bedding set in your nursery. 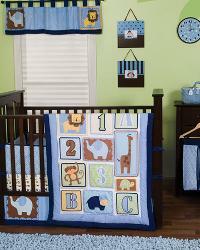 Cool blues, yellow and caramel mixed with soft sage green makes Jungle 123 crib bedding stylish as well as functional. Classic polka dots and stripes are paired with fresh lattice and geometric circles featuring celery green and shades of a beautiful opal gray with white. This modern baby bed set includes all the accessories you need to bring your baby home. 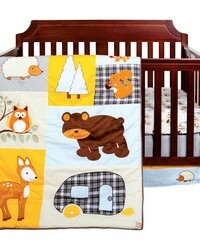 Fun forest animals make this an adorable baby bedding set. Vibrant chevron zigzags add the perfect touch of style and fun to your baby's nursery. The Levi baby bedding set brilliantly combines trendy chevron with patches of variegated stripes, mini dots, lattice and geometric circles in an adorable color palette of nautical blue, tiger orange, blue raspberry, chartreuse green and white. Choose this bold and modern baby bedding for your new little one. Classic polka dots and stripes are paired with fresh lattice and geometric circles featuring poppy pink and shades of a beautiful opal gray with white. This modern baby bed set includes all the accessories you need to bring your baby home. Classic polka dots and stripes are paired with fresh lattice and geometric circles featuring blue bell and shades of opal gray with white. This modern baby bed set includes all the accessories you need to bring your baby home. The Maya Dot crib bedding set combines traditional polka dots and stripes in a simple modern color combination of pink with chocolate and caramel browns. Your baby will be tickled pink to have their nursery decorated with this delightful baby crib bedding set. The fabrics in this group includes super soft ultra-suede, velour and linen accents. The set also has a super selection of decorative nursery accessories in coordinating colors which include: hanging mobile, crib sheets, blankets, window valance, diaper stacker and more. Wrap your little baby in the comfort of the outdoors with this 4 pc crib bedding set that includes comforter, sheet, dust ruffle and bumper. 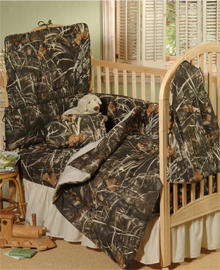 The Oak Camo baby bedding set also offers optional coordinating camouflage nursery accessories. Modern gray damask paired with pink bows and polka dots make the baby girl crib bedding set a lovely choice. Cute bird accents on the mobile and wall art. Out of the Blue baby bedding set for your precious new baby. Gray and navy polka dots are accented with gray chevron to give your baby boy nursery a clean and modern look. Paisley Park is sophisticated sweetness with ultra-feminine pink and green paisleys set against a crisp white base. A coordinating stripe, white mini-waffle pique framing and pink ultra-suede add accents to complete the delightful crib bedding and toddler bedding set. With lots of coordinating decorative accessories to complete your babys nursery, including: storage bins, window valance, crib sheets, diaper stacker, hamper, mobile and more. Penny Lane aqua and orange baby bedding is a modern choice for your baby nursery. Lovely stripes coordinate effortlessly with aqua criss cross sheets. 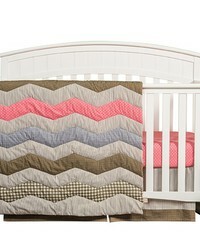 Patchwork baby bedding in navy, green, gray and white combine modern chevron and pinstripes with gingham and mini dots. This sophisticated baby bedding ensemble includes matching accessories and decor. Soft pink baby girl bedding set. Quatrefoil and chevron in soft shades of pink. Fabulously fun and bright, the Pixie Baby Aqua Baby Bedding is one of the top sellers. Whimsical paisley and polka dot bedding with matching accessories to complete the look is something Mom and baby will love. The Pixie Baby Pink crib bedding set offers a soft and cuddly pink and green paisley with green and white polka dots that will give a fashionable look to your baby girls nursery. With matching accessories, her nursery will look absolutely fabulous! He wants to rock! Let your little rockstar sing his favorite tune and strum his guitar as he dreams his rock and roll dreams. Your baby will love the guitars, spatter paint and musical note print mixed with a fun plaid in brown, blue, orange and tan. 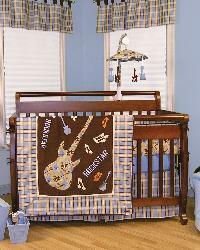 The Rockstar guitar is an embroidered applique framed on the coverlet that is backed with super soft natural Sherpa fleece that will look great in your future musicians nursery. Black and white oversized houndstooth is mixed beautifully with polka dots, solids and a mini floral print in black and white with touches of fuchsia pink and gray. Fun and fashionable baby bedding. Immerse your nursery into a fairytale only a princess could dream of with this dream like baby bedding set showcasing a pretty little princess in her horse drawn carriage along with her royal castle and a kissable frog.Once upon a time in your little girls nursery turn her nursery into a fairytale only a princess could dream of complete with her very own castle, horse drawn carriage and kissing frog. Pleasing to the eye tonal damask, floral and dot prints in a fantastic mix of bubblegum, rose, antique pearl, and soft yellow with cranberry, sand and key lime accents. Beautiful Crib Bedding - Luxurious decorative crib bedding and nursery bedding for your new cutie is easy with these adorable, unique baby bedding sets.